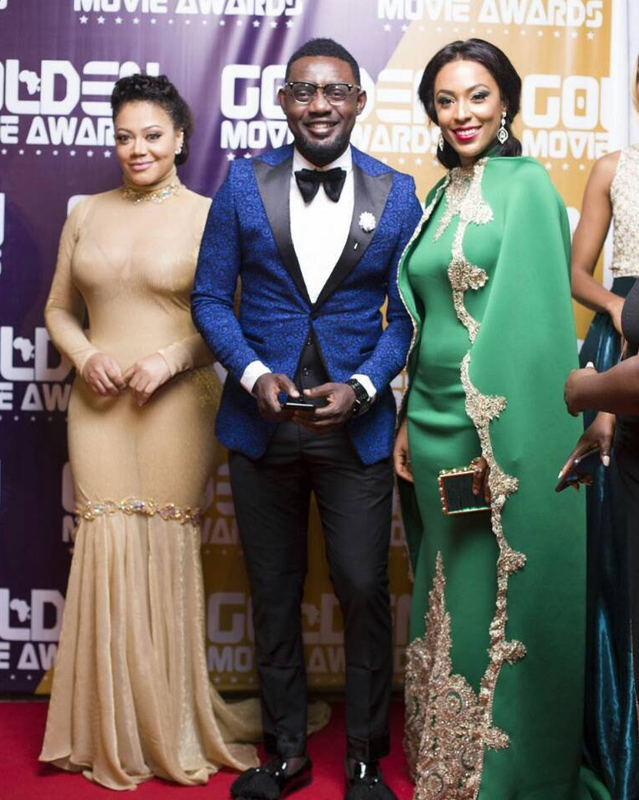 ACCRA, Ghana - Shimmering jewel tones ruled the red carpet of the 3rd Annual Golden Movie Awards Africa held in Accra this past Sunday. Hosted by Nigerian comedian Ayo Makun and Ghanaian actress Osas Ighodaro Ajibade, the GMAAs celebrated a broad array of African filmmakers for their efforts in telling home-grown stories to both African and international audiences. Our top picks include Ajibade in two stunning looks during the festivities. She basked in regal opulence in a Toju Foyeh gold gown with a dramatic train and stunned in an Anasimba By Zita ruby dress that accentuated every curve. Deranged actress Nadia Buari glowed in a champagne column gown with diamond collar designed by Ghanaian label Elsenams. As a recipient of 5 awards, Makun was fit for a king in a royal blue jacket and velvet bow tie while actress Benedicta Gafah also aligned with the golden theme in a Mardini sparkling ball gown. Lastly, Nikki Samonas stole the show in a Madlyn Mode embroidered green gown and matching cape.